Welcome back to the fourth part of our five-part series on Conversion Rate Optimization (CRO). Over the last several weeks we have discussed what exactly CRO is, how you can establish ideal buyer personas, and how you can better connect with those ideal customers. Today, we turn our attention to the types of methods you will use to actually create conversions. A common example of how businesses create online conversions is what’s known as a conversion funnel. 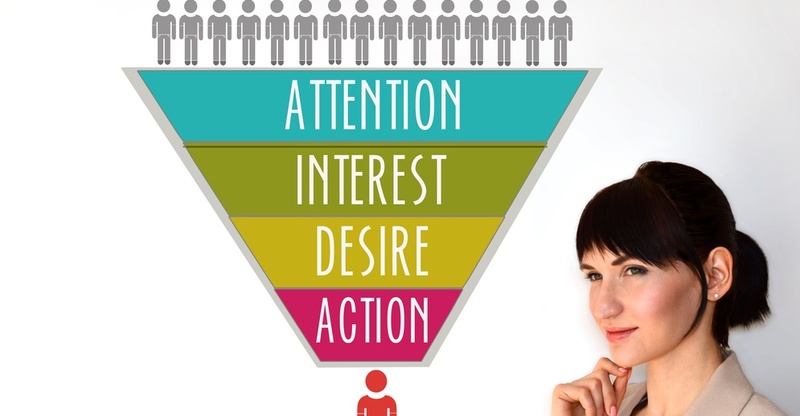 This funnel catches all of your targeted users that you are trying to attract and somehow encourages them to take an action, whether it is in the form of making a purchase or taking some other type of action that is beneficial to your company. Know what your audience wants: By now, you have already established your buyer personas and researched ways you can better connect with your target audience. Therefore, you should have a pretty good idea of what it is your target audience wants. Now, you must also consider what you can offer to your audience. How will you get them exactly what they need? What methods will you use to solve their problems? What types of information or offers will you put into this conversion funnel? Determine the format you’ll deliver these items in: What format will the goods at the top level of the conversion funnel come in? This entirely depends on the interests and needs of your target audiences. Some people will be more likely to consume videos, podcasts or other forms of audio or visual media. Other people might prefer high-quality written content, such as white papers or in-depth blog posts and articles. You might even choose to provide more interactive options, such as online classes, Google Hangouts or webinars. Regardless of which option you choose, make it clear to your audience exactly what you are providing and how it benefits them so you can ensure the best possible user experience. Figure out how much this content will cost your audience: The cost does not have to be monetary. It could be something as simple as an opt-in to your email newsletter, or providing some answers to simple survey questions to help you learn more about your customers. But in the vast majority of conversion funnels, there is some sort of cost associated with the content you are providing. Make it easy for your customers to get what they want: Of course, having determined your cost, you still need to make it easy for your customers to get that content. Nobody wants to have to jump through a ton of hoops just to download a white paper. People don’t want to feel like they’re being tricked into downloading something. Be upfront right away about what it takes to access the content, and then make the delivery process as simple as possible. Again, it’s all about providing the best possible experience for your users and customers. Encourage sharing of your content with friends: You should also make it as easy as possible for people who go through your funnel to share the content with their friends, so you can continue to grow your customer base and collect more user information. Make sure you have social sharing buttons embedded on every page of your website, and even include a message after your users have downloaded your content requesting that they spread the word among their friends and colleagues. Keep them coming back for more: Once you’ve had a customer go through your conversion funnel, the process isn’t over for good. You should give them a reason to come back again at some point. Regularly offer new content on your site, and work to develop various series that offer insider tips and tricks. By keeping people coming back to your website over and over again with this content, they will be far more likely to make purchases on your website as well. Stay in touch: If you’ve collected email addresses through your conversion funnel, don’t just let them collect dust! Follow up after a reasonable amount of time, and offer them something of value. Add them to your newsletter mailing lists so they stay up to date about what’s happening at your company. Of course, you should avoid spamming your contacts, but a reasonable amount of communication is highly encouraged so you can keep your customers thinking about your business. Conversion funnels are essential elements of any overall CRO campaign. While they do not necessarily directly create sales, they do create more customer engagement and loyalty, which is a key element of conversion rate optimization. Next week, we will wrap up our CRO series with a discussion of CRO analytics and the types of tools you can use to track your success.